Hybrid vehicles contain two engines: (1) one electric motor, which uses the power to drive the vehicle and (2) one combustion engine (or a fuel cell), which supplies electric power to the electric motor or the batteries. In “parallel” systems the combustion engine also drives the vehicle. Hybrids generally require smaller batteries than full-electric cars, because they also carry fuel. The energy content may be limited but the specific power (kW/kg) has to be high. Hybrid vehicles only turn “renewable” if they use fuel (diesel, petrol, hydrogen) or power from renewable sources. The concept of EVs is actually quite old, dating back to around 1900. Although fuels won the battle in those days, EVs are returning. Especially driven for their local benefits on the environment, many regions and cities are setting up trials and programs with EVs. Batteries will be crucial for their success. Battery capacity, lifetime, safety in automotive applications, charging, and system design are all issues that are investigated. Concerning safety fire hazards, associated with the use of lithium, need to be minimized. New concepts for speed-charging or exchange of batteries may be boosting the market, because they increase the range. Different vehicles require different battery types. Light-weight EVs require batteries with a high energy density (kWh/kg). Vehicles running on electricity do not necessarily fall in the category of sustainable transport, because they may still use power from fossil or nuclear power plants. Nevertheless, if the share of power from renewable sources increases, electric vehicles (EVs) also become more sustainable. In some cases, EVs could exclusively run on power from renewable sources, for example, when the batteries are charged in a solar-powered filling station. In general, two types of EVs are being developed. Full-electric vehicles are essentially powered by the grid, by means of storing power in batteries. Trains, subways, trams, and trolley buses are grid-connected and can also be regarded as full-electric transportation. Hydrogen is a versatile energy carrier that can be produced from any fossil or nonfossil primary energy source. It can be converted into mechanical energy in combustion engines and into power using so-called “fuel cells,”, but the business case has not been widely spread yet. Although (fossil) hydrogen was already applied in some plane flights, technical issues like on-board storage still have to be solved. Technologies are still in their early days of reducing costs— even more if combined with renewable sources—and overcoming technical barriers. In addition, several types of biofuels are currently under development that could become available in the mid or long term. Most of these technolo­gies use lignocellulosic biomass (“second generation”) in the form of wood residues, paper waste, agricultural waste, and dedicated energy crops. Feed­stocks of this type are far larger and are expected to be more “sustainable,” because of higher yields, lower net greenhouse gas emissions, and a lack of competition with food production. Currently, creating biofuels from algae (hydro-cultures that could pro­vide high yields of oil) is gaining interest. Test flights of planes with biofuels (in at least one case originating from algae) have been performed. Ethanol can substitute gasoline. Bio-ethanol (produced from biomass) is commonly used in low blends in gasoline, typically 5% (E5) or 10% (E10) on volume basis. Higher blends can be used in flexible fuel vehicles (up to E85), which are currently offered by a wide range of manufacturers. First-generation bio-ethanol is produced by fermentation of sugars. These sugars can be extracted from feedstocks like sugar beet and sugar cane, or the sugars can be made from starch in crops like wheat or corn. In particular, shipping also offers an opportunity to use cheaper, low-quality biofuels, because marine engines are typically suited to use a low fuel quality (fuel oil). But this opportunity has hardly been applied yet. The most commonly produced liquid biofuels for transportation are biodiesel and ethanol. Chemical and energy characteristics of commercial biodiesel are largely the same as fossil diesel. There are slight differences between biodiesel (or fatty-ester methyl ether; FAME), pure plant oil, and synthetic biodiesel. Biofuel blends can be burned in conventional combustion engines with or without adaptations, depending on the type of fuel used. Low-percentage blends (5-20%) in conventional diesel can be used in conventional engines. 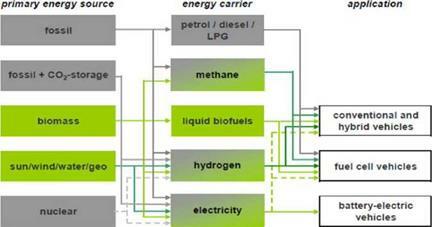 Pure biofuels require engine adaptations to specific characteristics of the fuel. Some biofuels even enable engine adaptations that improve perfor­mance or energy efficiency. Renewable energy technologies can be applied at different places in the transportation supply chain (from primary source to type of vehicle; see Figure B.5). Figure B.5 From primary energy source to end use in vehicles. The lighter gray regions represent the technologies where renewable energy can be applied (From RETRANS).